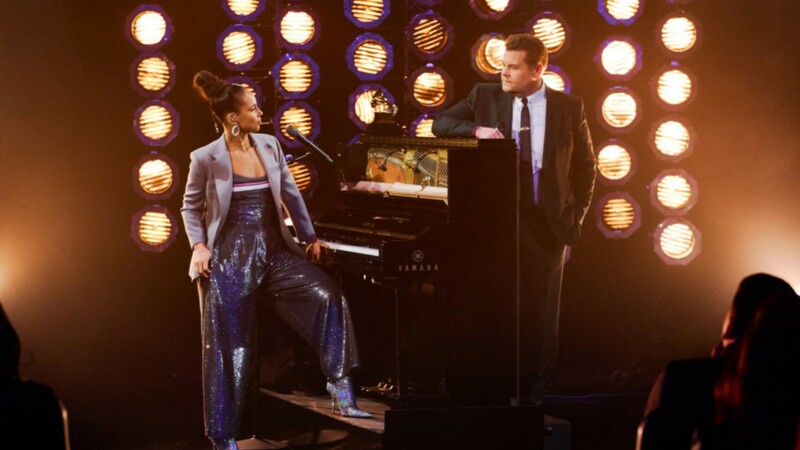 Before the 2019 Grammys air on Sunday, Feb. 10, Alicia Keys and James Corden performed a parody of “Shallow” from A Star Is Born that is meant to prepare Grammy attendees for the kind of night that awaits them. Performed on Corden’s The Late Late Show, the song sounds just as good as the version Lady Gaga and Bradley Cooper sing — but the lyrics? Well, the lyrics are pure gold, and they just might be better than the original. You probably already knew there’d be some shenanigans in store the second you saw Corden’s name attached to the news of a performance of “Shallow” on The Late Late Show. And this particular song is really too good to miss. As part of her Late Late Show interview, Keys, who will be hosting the Grammys on Sunday, asked Corden for some hosting tips (he’s no stranger to hosting big award shows, after all — notably, Corden hosted the Grammys in 2018). So Corden brought Keys over to a piano, and the pair began to sing to the familiar strains of “Shallow,” except with the lyrics switched up to include some of Corden’s biggest hosting tips for Keys. Naturally, it was a hoot. Pretty solid advice, right? And it’s good that Keys is getting the hosting lowdown now — because this is her first time ever hosting a major award ceremony. Even more notable, this is the first time the Grammys has had a female host since 2005, when Queen Latifah hosted. In others words, all eyes will be on Keys, so she’s gotta nail this. Thank goodness Corden helped her out. Catch the 2019 Grammys when they air on Sunday, Feb. 10 at 8/7c on CBS.